Just one day after President Putin announced his support of Dmitry Medvedev’s candidacy to be the next president, Dmitry Medvedev announced his support of Vladimir Putin’s candidacy to be Prime Minister, should he win the election. Putin spoke at an event to the Russian Chamber of Commerce shortly after Medvedev’s remarks, but did not touch on the question. First, what would be the purpose of such a statement? 2. If it’s not genuine, what is the point? Medvedev has no support base in the country, he has never run for political office, and is still relatively unknown, despite his work on the National Projects. Before Putin’s announcement, polls indicated that Russians actually prefer Ivanov. Openly toying with the idea of Putin as PM is somewhat analogous to Sen. Clinton’s coyness with regards to what Fmr. Pres. Clinton’s role would be in her administration. Just like Sen. Clinton, Medvedev is trying to build popularity around his association with an already-popular political figure. So how will Putin respond? 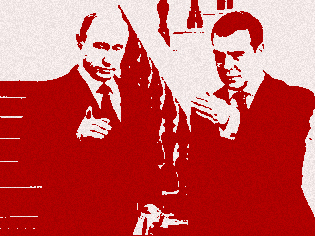 So what if Putin does not intend to accept Medvedev’s offer? My guess is that he will simply let this play out as long as possible – he might note that it is an ‘interesting’ proposal, etc. Ultimately, I don’t think Putin wants this job, though he may stay on if necessary to prevent ‘clan wars’ between the various siloviki factions and to insulate Medvedev from the loser in the succession process. In my opinion, Putin would much rather head up the Sochi Olympic Games than be PM. Lastly, this announcement will no doubt set the anti-Russia crowd off, but then again, no announcement at all would seem just as devious to them. This entry was posted in Medvedev, Putin. Bookmark the permalink.